LIFE on Hold Productions director and actor Sarah Christiner already had four tattoos commemorating productions that had been particularly meaningful to her. Therefore, it seemed only fitting when she started working on latest show A Clockwork Orange that she would add to the collection. “I knew I would want a tattoo for this one, but wasn’t sure what,” Christiner, of Como, said. “6655321 is Alex DeLarge’s assigned inmate number at Old Staja (prison). Christiner got the number tattooed on the back of her neck at 93 Tattoo Studio in Victoria Park, close to the Broken Hill Hotel where the production will be performed. She said she had no regrets adding it to make 24 tattoos in total. “Plenty of people have commented that it looks like a prison tattoo, so I’m pleased with that,” she said. A Clockwork Orange has been a play that resonated with Christiner since first reading the novel at 14 years old and blitzing her TEE English exam essay on it. She said a script existed, but it was with music and quite stylised, so she had chosen to adapt the novel for the Life on Hold Productions season. “It is a fast-paced episodic play, spanning about four years, very closely based on the novel and often cyclical in nature,” Christiner said. “The story is about man’s free will and what becomes of us if that is taken away. “This point is demonstrated with hyperbole, which does render the play graphic and violent at times and not suitable for children under 15. “As far as genre goes, we can almost call it dystopian, but I believe it also has elements of a coming-of-age story. 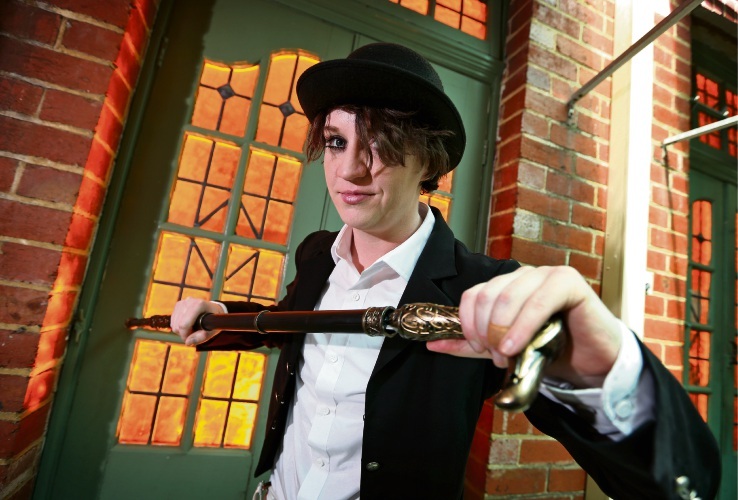 A Clockwork Orange will run October 17-November 2 with tickets at www.whatson.com.au/clockwork.